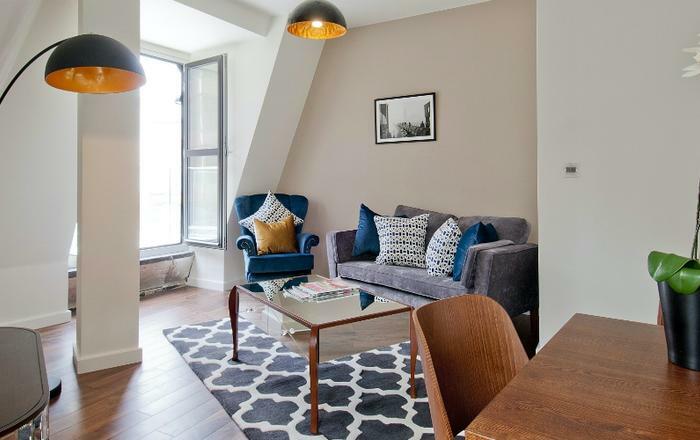 A fresh and modern studio flat in the heart of the West End, London. 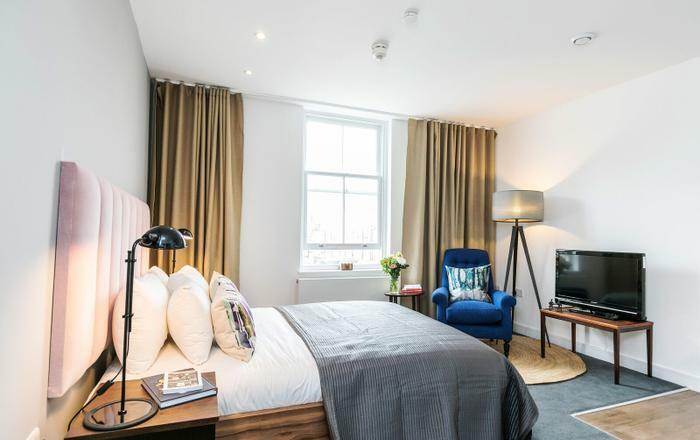 Newly refurbished and stylish throughout, this is the perfect base for an extended stay in central London. Forget about tubes and taxis - walk to the theatre, walk to Oxford Street, walk everywhere in mere minutes! A bright and modern living room with contemporary decor. Large, double glazed windows and hardwood floorboards run throughout. The studio is fully furnished including a sofabed, dining table and chairs plus a comfy double bed. There is also a flat-screen, internet enabled TV allowing streaming if you have the relevant accounts. 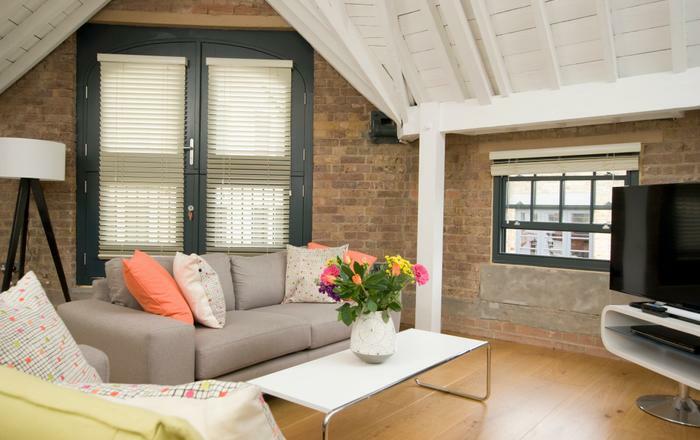 This studio flat has been creatively partitioned to provide a private sleeping nook and a separate living area. 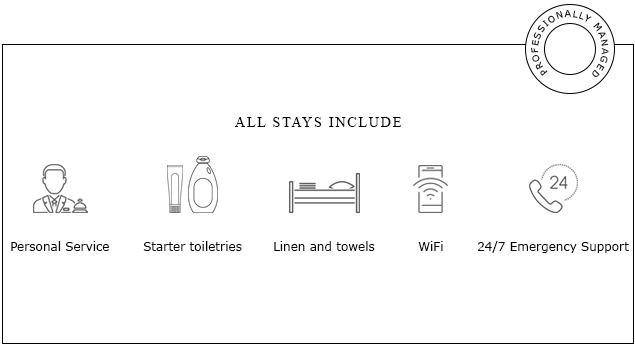 Quality linen, newly laundered and pressed, is provided for each stay. A separate and stylish kitchen is fully equipped including an electric hob, oven, fridge-freezer, microwave, toaster, kettle and washing machine. Modern, fully tiled bathroom with a walk-in shower, WC and basin. Starter toiletries and fluffy white towels are provided as standard. 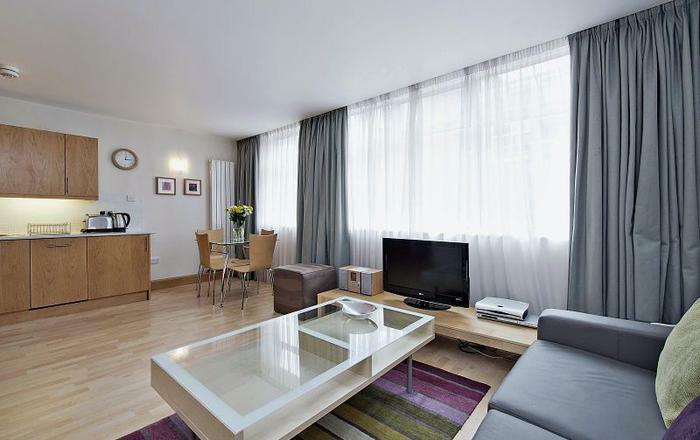 Goodge Street underground - Northern Line - 5 minute walk away - Zone 1. 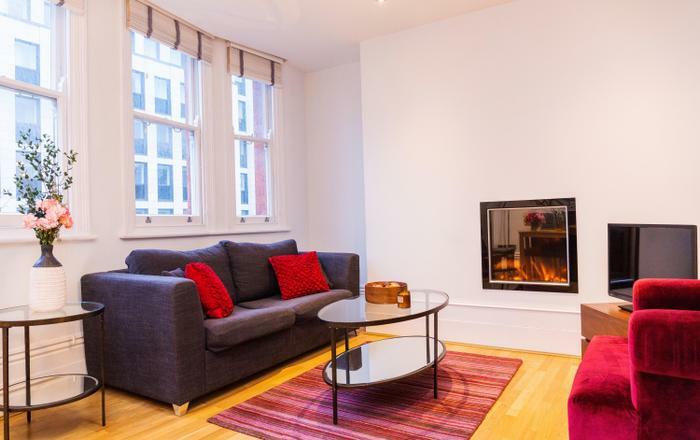 Oxford Circus underground - Bakerloo, Victoria and Central lines - 10 minute walk away - zone 1. Tottenham Court Road underground - Central & Northern Lines - 7 minutes walk - zone 1. - A dryer is located in the communal area for the exclusive use of the studios. 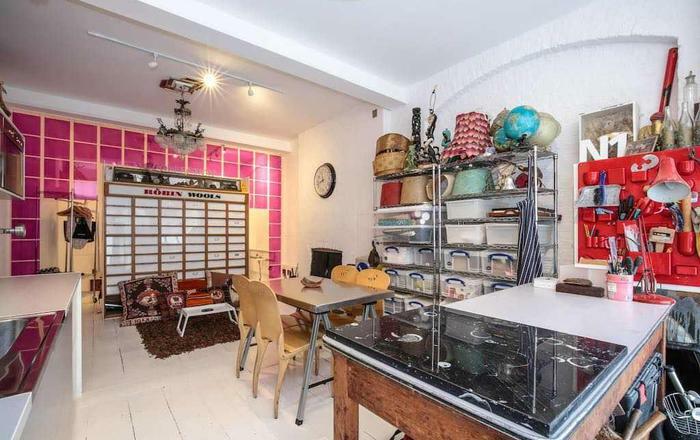 - There are three studios in this building, each individually styled and unique. - The studio is on the second floor and the building is a walk up - no lift. This is a superb location to immerse yourself in the best London has to offer. Many of the must see sites are on your doorstep including the prestigious British Museum. Fitzrovia is a creative neighbourhood and home to many architects, film production companies and famous advertising agencies. There are small, private art galleries dotted throughout the area and international cuisine is to be found around each corner. Academia and commerce combine to give Fitzrovia a gentle but vibrant atmosphere - it is a pleasure to wander the side streets but if you do become a bit worn out by urban life stroll up to Regents Park in ten minutes. Excellent location. Apartment was as shown -- clean and well maintained. Good experience and reasonable price. Management company also did a good job. 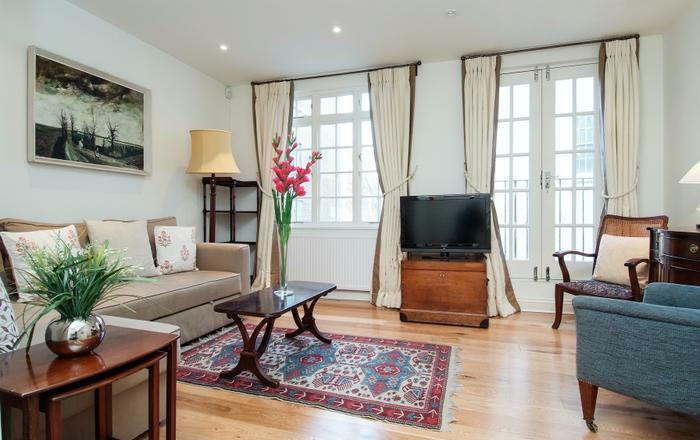 Perfect location, very walkable to West End/Oxford Circus. Clean and well-kept. Check-in process was very convenient. Would highly recommend! Nous avons passé un excellent séjour, quartier calme mais avec beaucoup de restaurants et commerces. Le métro est à 5 mn et proche de tous les lieux d'intérêts L'appartement est très bien agencé et équipé, le fonctionnement avec un code permet de partir facilement Je recommande cette location ! I've been in London with my friend for four nights in November 2016. The apartment is very very nice. All was very clean, and this is for me the most important thing. The bed very comfortable. I found also a hairdryer and adapters for the electric outlets. We didn't use the kitchen because we went outside for the meals. The location is strategic, near from the tube station, but after a few minutes walk, we was in Oxford Street or at the British Museum. Around there are many restaurants and pubs. The instructions to reach the apartment and open it were very clear and we spend a beautiful time in London and also in the apartment.